The first two-year-old race of the season at Pontefract is The Farmer Copleys GFF Farm Shop of the Year 2019 EBF Novice Stakes. The race title celebrates the new partnership between the racecourse and the award winning local farm shop, who will be supplying a luxury Yorkshire hamper to the winning connections in every race at Pontefract in 2019. The race went the way of John Quinn’s ‘Carey Street’ in 2018 and the trainer will be hosting Pontefract Annual Badge Holders on the yearly stable visit later in the season. There is £25,000 up for grabs in the RIU Hotels and Resorts Handicap. The race was fought out by Foolaad and El Astronaute last year with the former just getting the better of the argument. It is a race that always throws up future winners and is one to keep an eye on. The 6f Maiden has thrown up some decent winners in the past and David O’Meara has won divisions of the race in the last two years with Black Isle Boy in 2017 and Three Saints Bay in 2018. Any representative from the O’Meara yard should be noted. This race is run in honour of staff member Richard Pemberton, who has worked at the track for 30 years, including a spell as head groundsman. Everyone hopes he has a long and happy retirement. 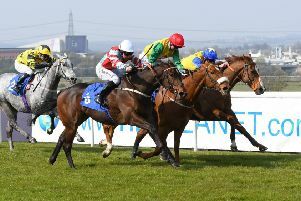 Napoleons Casino Bradford return for the third year with a programme of another five sponsored races at the track in 2019 while the Golden Horseracing Club sponsor two races on the card, promoting racehorse ownership with their club.